For today’s deals roundup, we bring you some interesting cashback deals of Paytm Mall, which are on gadgets like flash drives, headphones and more. Whether you’re on the lookout for a flash drive for storage or a good pair of headphone to enjoy your music on, we’ve got you covered. We have picked out some of the best deals Paytm Mall has on brands like SanDisk, JBL and more. The SanDisk USB 32GB OTG Pen Drive features a dual microUSB and USB 3.0 connector, which allows you to transfer files from your smartphone to PC easily. The pen drive comes with a retractable design that protects it from dust and other potential damages. As per the company, it can transfer the data at the rate of 130MB/s. Click here to buy. The JBL T450BT is a wireless on-ear Bluetooth 4.0 enabled headphone. The device comes with an inline microphone and remote to manage audio tracks and calls. As per the company, it has a battery life of up to 11 hours. Click here to buy. The boAt Rockerz 400 is an on-ear wireless Bluetooth headphone, which comes with a built-in noise-canceling microphone that lets you answer calls without worrying about outside noises. The control buttons to manage volume and audio tracks are placed on the earcup. Click here to buy. The Portronics POR 871 is a compact water-resistant Bluetooth speaker. The device comes with a built-in mic, which lets you answer the calls when the phone is connected to the speaker. The device is also equipped with an FM radio that gives you an access to a wide range of channels. Users can also connect their device via an AUX or a USB cable. Click here to buy. 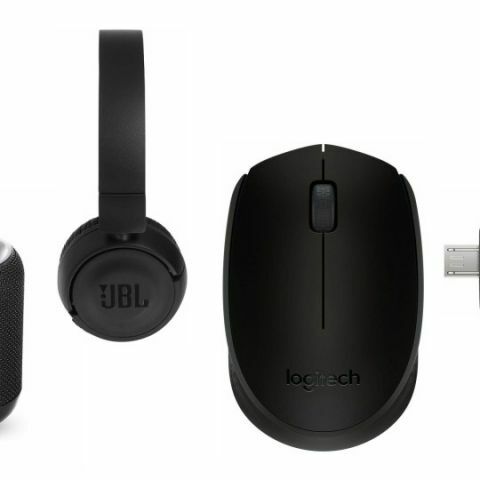 The Logitech B170 Wireless mouse connects to your PC via a nano USB receiver. The mouse comes with an Advanced optical tracking, which lets the mouse works on almost any surface. The device works within the range of 10m from a connected device. Click here to buy.